His policies are all laid out on his website at Trump Positions and anyone who has read them know they have always aligned with his impromptu rally speeches, but we finally got to hear the man lay one out, with much more detail than the website, in a “Presidential” demeanor that many have doubted him capable of. Today he set the record straight. In the first public unveiling of “Trump, the President.” he walked up to the podium today and gave one of the most coherent, direct-to-the-point, unifying and assuring messages to the country that I have heard since JFK. We have been dealing with the rest of the world in a totally misguided manner, and he intends to set that straight when elected. The Trump campaign needs to incorporate some of this new vision into the roadwork for the upcoming final laps of this race. His supporters already know what he’s talking about, but in this crucial part of the cycle he needs to relate more to the uninitiated and the people who only have seen what the main stream media has pictured for their own particular interests. No matter what anyone thinks, behind the MSM painting is a canvas that is just as, or more committed to the future of our people and our country as ANY person that has ever sat on the big chair in the Oval Office. There is no practical reason for this to come to a brokered convention. Mr.Trump now has 953 bound delegates. He is within a couple good wins of have the magic 1237 that requires them all to vote Trump during the first ballot. No one else running could reach that number, even if Trump didn’t get another vote. All the other two candidates can do is try to derail his path to prize, and attempt to steal the nomination behind closed doors. That’s why everyone needs to vote and not just cheer him on in Facebook. People who have never voted in their lives have registered and done so. Every vote counts especially yours! Moving into next week’s critical showdown in Indiana, Mr.Trump must make a bond with the remaining people out there that care as much about this country as he does, even if they have been misled by other candidates up to this point. Many have been switching to Trump after last weeks failed collusion against Trump for last Tuesday’s primaries. If things go smoothly, this nomination will be decided on June 7th with a big win in California. It can, and must be done or the Convention will be open to many different underhanded means of corruption. 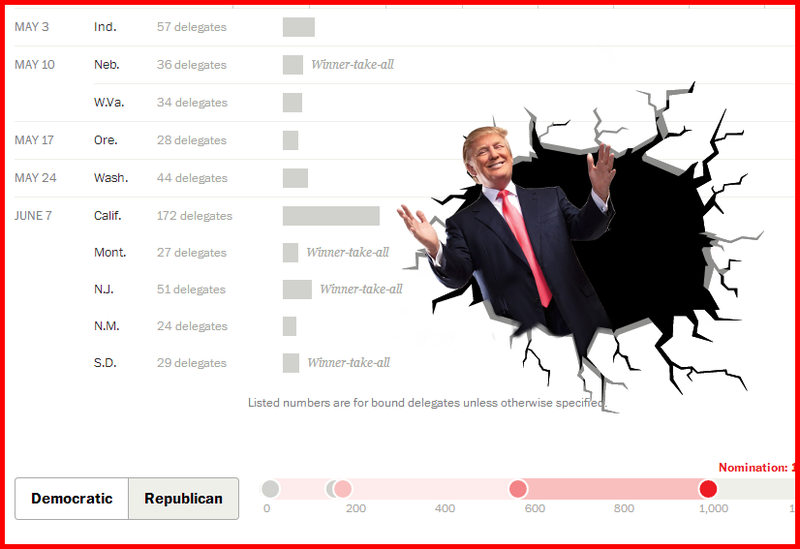 You can follow the progress here on the Delegate Tracker in real time. Let’s get everything organized and done right, so we can move on to the real battle against Mrs. Clinton, if she manages to stay out of jail. It’s up to you. Back the movement and Make America Great Again! Here is the turning point speech, in case you missed it! BREAKING! “Eskimo” is now RACIST! You won’t believe the others on the list! Bonus banned cartoons.